The Congress on Saturday hit out at Prime Minister Narendra Modi alleging that the country witnessed his “monologue, fake bravado and narcissistic lies”, as Rahul Gandhi accused him of being “solely responsible” for the delay in arrival of Rafale jets. “Dear PM, Have you no shame at all? YOU stole 30,000 Crore and gave it to your friend Anil. YOU are solely responsible for the delay in the arrival of the RAFALE jets. “YOU are WHY brave IAF pilots like Wing Cdr. Abhinandan, are risking their lives flying outdated jets,” Gandhi said on Twitter. 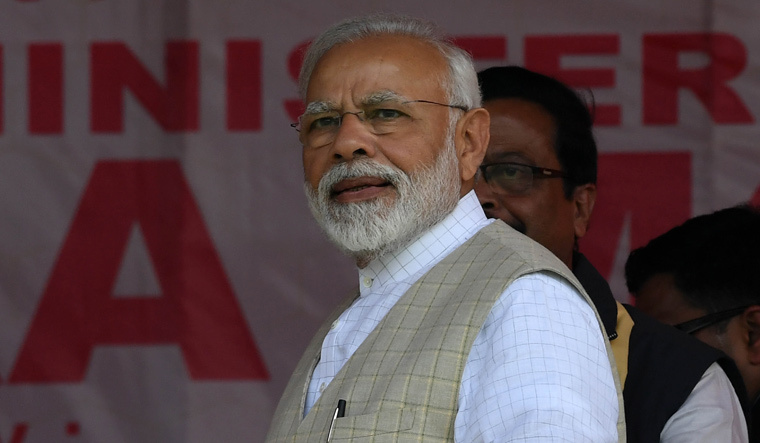 The response came after Modi said the country was feeling the absence of Rafale and results would have been different if India had the fighter jets as he attacked the Congress for its tirade against his government over the aircraft deal. “India is feeling the absence of Rafale. The entire country is saying in one voice today, that if we had Rafale, the results would have been different. The country has suffered a lot due to selfish interests earlier and now politics over Rafale,” the prime minister said at the India Today conclave. Congress chief spokesperson Randeep Surjewala said the nation witnessed a monologue by a “narcissistic” prime minister sans any sense of accountability. He said the prime minister is obsessed with one word‫―'Modi'‫―and forgets that India is a thriving democracy of 132 crore people with a multitude of opinions. “When will Modiji take decisive action against Pakistan-sponsored terror? Compromising national security and gross intelligence failure are the characteristic style of a non-functioning Modi government. “In last 56 months, 498 soldiers and officers have been martyred in Jammu and Kashmir alone. In the month of February 2019 alone, 55 brave soldiers laid down their lives due to the menace of Pakistan-sponsored terrorism,” a statement quoting Surjewala said. He said the prime minister had blatantly “politicised” the bravery and martyrdom of India's soldiers as a political pamphlet. “Latest instances of Modiji's cronyism are the Rafale deal and handing over of 5 out of 6 airports to his crony friends,” the statement said. The Congress also hit out at the ruling dispensation for its alleged poor handling of the economy. “Modiji's directionless policies and myopia of economic vision have been disastrous for India's economy. No wonder, every economic expert across the spectrum now says 'Modinomics' is harmful for the country. “With nearly 50 days to go, India awaits for Modi government's departure,” Surjewala added.